We shared wonderful energy with the community during our final testing of the "school year" at Lakes Martial Arts at the end of June. Two students successfully tested for their first degree black belt and another completed a 2nd degree midterm. Have a wonderful summer! Classes begin again September 5, 2018. Mr. Lund and Mr. Marquardt passed their test for first degree black belt decided! Another SUPER FANTASTIC testing at Lakes Martial Arts this week. We hosted VIP Guests Mr. Haynes and Mrs. Reinhardt as over 50 students demonstration excellence on the mat while testing for their next rank! This evening was very special for Ms. Annika Knudsen who earned her rank of 1st degree black belt decided and Mr. Beckett Nielsen who earned his 2nd degree black belt. Congrats students on your hard work and parents for your support! 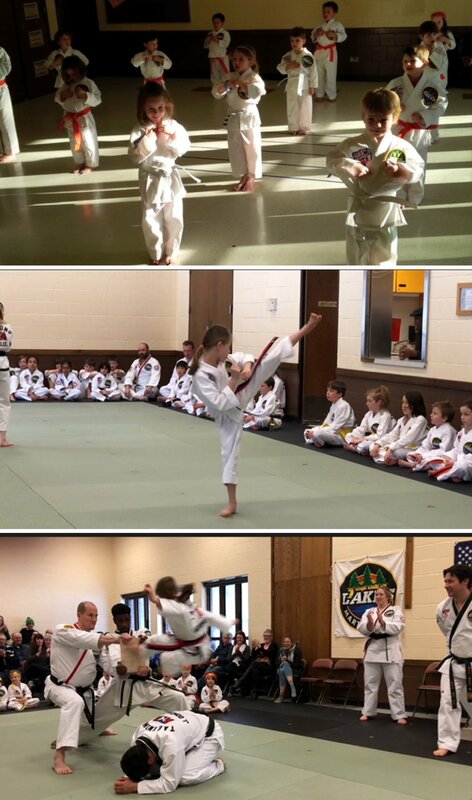 These images were sent to me by Ms. Knudsen's parents of her progression from a Tiny Tiger (see below, white belt smiling!) to her graceful, high kicks on the evening of her black belt testing. Check out her running jump side-kick over an obstacle: Mr. Gonzalez! Congrats to all midterming and testing! 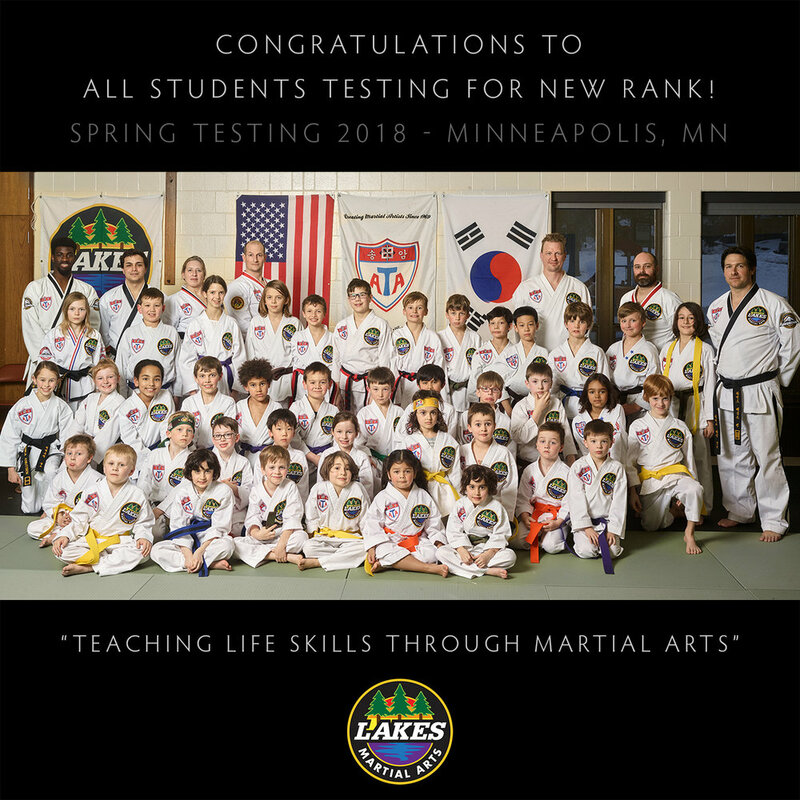 Congratulations to Lakes Martial Arts students who successfully completed their midterming and rank testing on February 8 at Pershing Rec Center in Minneapolis. The new split Tiny Tiger / Karate Kid testing format proved successful. And students benefited from the extra time to demonstrate quality of technique and their self-esteem gained from the last 10 weeks of training. Special thanks to the efforts of the judging panel comprised of the Leadership Team including Mrs. Reinhardt, Mr. Hogen-Chin, Ms. Barnes, Ms. Kamrow, Mr. Kamrow, and Otto. 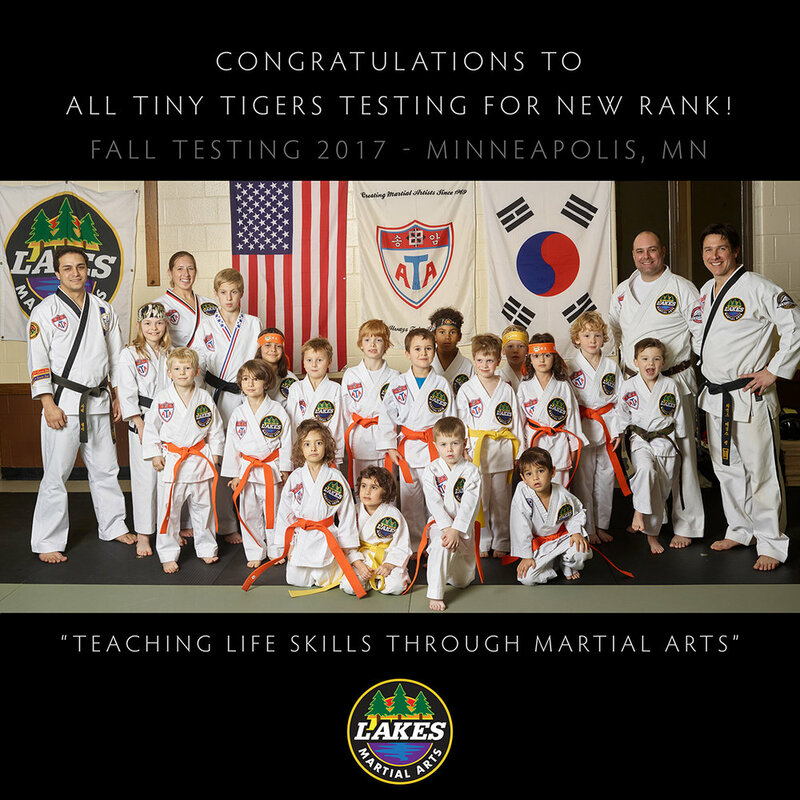 Quinn, Drew, Leif, Jude, and Alexander participated in the Tiny Tiger testing was was greatly appreciated by not only the Tiny Tigers, but parents and instructors, too! Mr. Gonzalez and Mr. Kern demonstrated their form in front of packed room. Jayden and Ryan both earned their sparring gear and will graduate to the Karate Kid class next session! Highlights in the Karate Kid and Adult testing including four students promoted to 1st degree black belt recommended (Ms. Reinhardt, Quinn, Drew, and Beckett), two successful midterms completed by Ms. Kamrow and Mr. Kamrow, and several students who earned sparring gear. One new opportunity for testers is the opportunity to earn an excellence stripe on their new rank. Each class was given several opportunites to demonstrate excellence through the following: 1-minute burpee contest, round-kick contest, push-up contest, and punching / deep stance contest. How fun! Karate Kids and instructors display confidence and self-esteem in our class portrait after testing. 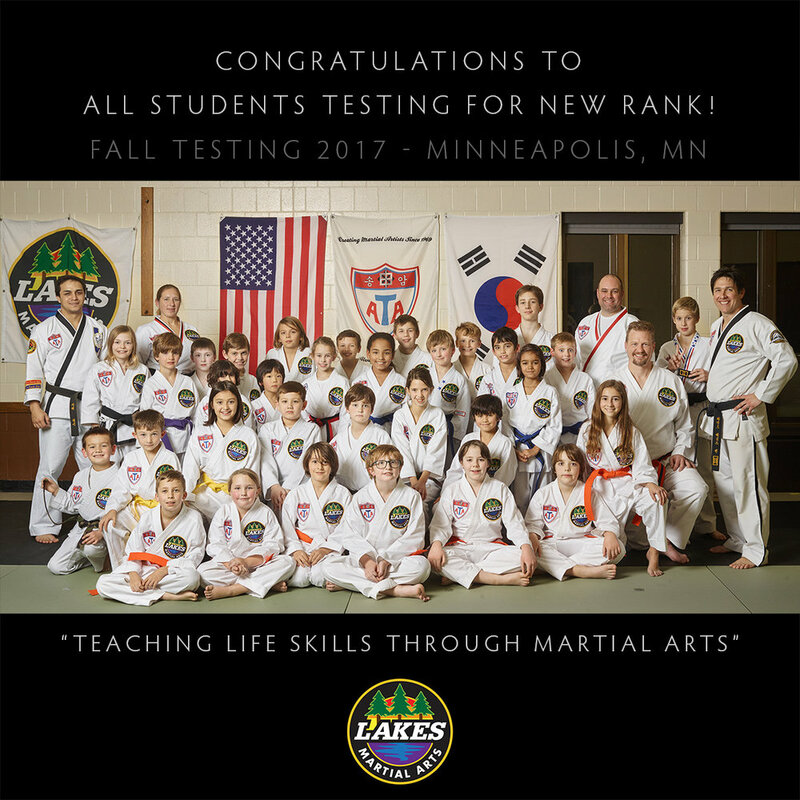 What a way to top off another year at Lakes Martial Arts with our year-end rank testing. 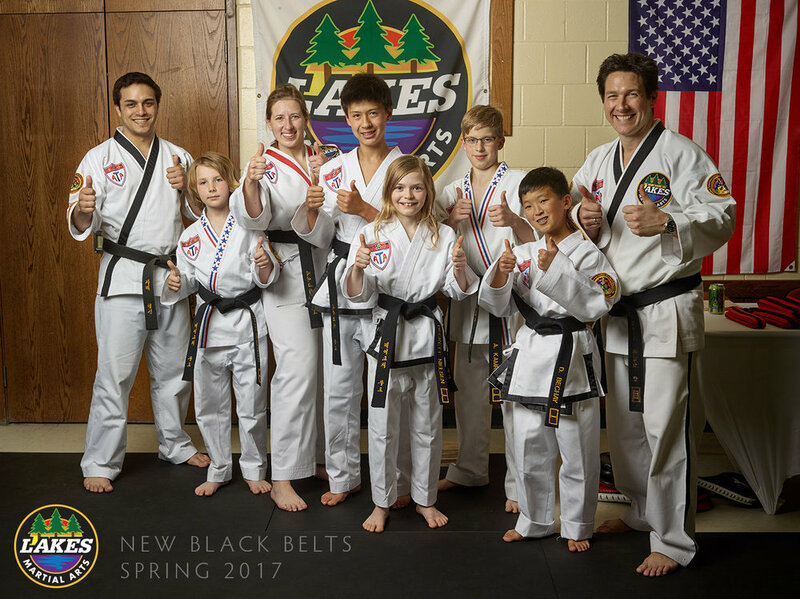 Last night we had a very special rank promotion ceremony in Minneapolis: we awarded our very first black belts who began their training with Mr. Kern three years ago! Congrats to Ms. Barnes and Mr. Kamrow. We also had Otto, a valuable leadership team member, successfully demonstrate eight consecutive color belt forms to earn his black uniform. Mrs. Reinhardt earned a huge hug from the students at the Armatage club… this was our first combined testing. The baked potato potluck was a hit! Students, enjoy your summer break! Classes resume mid-September. Congrats to Ms. Barnes and Mr. Kamrow who earned the rank of 1st degree black belt decided on June 29, 2016 in Minneapolis. They began their training with Mr. Kern three years ago! 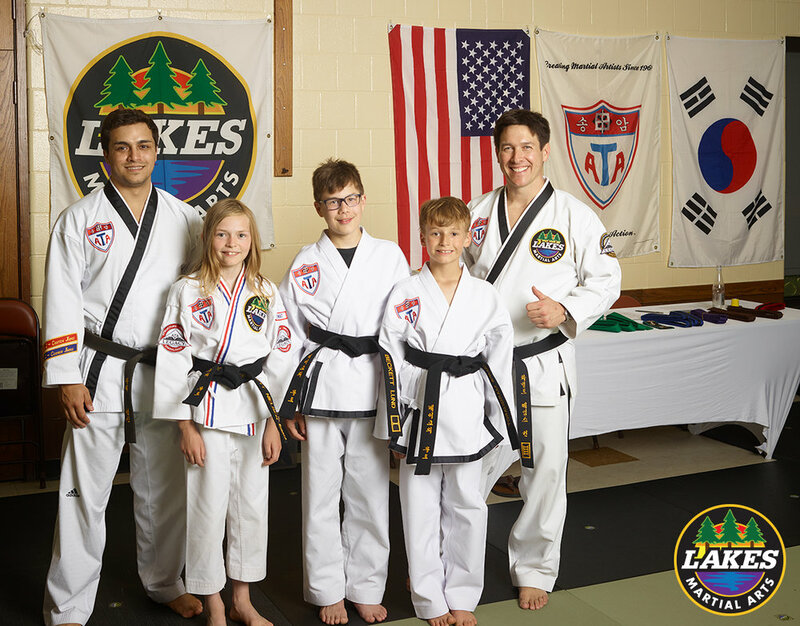 Last week we had a very special rank promotion ceremony at Lakes Martial Arts in Minneapolis: we awarded our very first black belt, another leadership team member earned a black uniform, and a stellar class of new intermediate students earned their sparring gear. All in all, over 40 students tested for a new rank, one of the largest ceremonies we've ever had since we opened in 2013! Mike Moh (who plays Agent G & Ryu in Street Fighter: Assassin’s Fist) was a student of Master Niska. One of Master Niska’s favorite food: Cheesecake! Master Dave Niska with Mr. Kern (and Agent G in the background) pictured left. Mrs. Jessica Reinhardt earned her black uniform while Mr. Clay Hogen-Chin earned his first-degree black belt, pictured right along with Master Niska and Mr. Kern. Mrs Jessica Reinhardt earned her black uniform as part of the Lakes Martial Arts Leadership team (note that red collar!). Mr. Hogen-Chin earned his ATA 1st Degree Black Belt and shares his goals with the Lakes Martial Arts community. Attend at least one tournament in our region each year. We appreciate Mr. Hogen-Chin's continued leadership in Songahm Taekwondo! Congrats to the Hogen-Chin on their first black belt! I see three more black belts in your future! This family believes that families that kick together, stick together! Winter Testing 2015 - Congrats new color belts! Congratulations to the new class of color belts at Lakes Martial Arts Winter Testing 2015 held at the Pershing Rec Center in Minneapolis, MN on February 9, 2015! Special thanks to guest judges Mr. Nick Deutchman, Mr. Juan Gonzalez, and Mr. Jeremy Morton. What a colorful class of great attitude and wonderful respect. Congrats to a new class of color belts! Congratulations to a new class of colored belts at Lakes Martial Arts testing in Minneapolis on Nov 10. We had a wonderful turn-out and special guests Mr. Ken Hoops and Mr. Juan Gonzalez said they had a wonderful time! Special thanks to the supportive parents for the the wonderful gifts for our little bun in the oven! A very special color belt testing! Master Hauptman, ATA's highest ranking master instructor (6th degree), flew out from Colorado to be our special guest judge. His stellar leadership with Paragon Martial Arts has created amazing instructors, school owners, and world champions which all began in the Midwest decades ago and continues through clubs like Lakes Martial Arts. Master Hauptman also broke a super high board break with two boards above Mr. Ken Hoops' head and wowed the crowd! In addition, 4th degrees Mr. Ken Hoops, Mr. Brendan Rogers, and 2nd degree Mr. Shawn Mingus served on the stellar judging panel. Students demonstrated respect at all times to judges and fellow students… which has been one our of focus life skills goals this session. Well done! We had several intermediate students smash through their boards and fancy spar… including one student, Sylvi, who broke a board above her head! Three black stripe awards were given to students who demonstrated the qualities of excellence during this recent session included: Auggie (Tiny Tigers), Owen (Karate Kids), and Derek (Teens & Adult). Congrats on your hard work and great attitude! We had four 1st degree recommended black belts (Dave, Kelly, Max, and Foster) prepare for their black belt test by demonstrating forms, board break, sparring, and a great attitude! Good luck on your testing in August in Florida and we would LOVE for you to join our club after you settle in your new home! We broke the sound barrier in the classroom with positive energy from clapping and cheering from our supportive parents! Our Adopt-a-Mat program was a success and we were able to fill the entire floor with two full rings of safety flooring! Thank you to the parents for helping to make this a reality (Mr. Kern is keeping busy teaching all the private lessons). The Tamm family helped to coordinate our first annual Taco Potluck and brought a very special custom, Lakes Martial Arts cookie made by Cookies by Design. They were amazing! In case you missed Master Hauptman's amazing board break HERE'S THE VIDEO. The parent stripe testing awards are given out before testing after students complete their parent sheet. I loved Nora's parent sheet for all her practicing (notice all the circles) and wonderful achieved goals (Respect was our focus for this session). Special thanks to Mathias for the wonderful artwork demonstrating our ATA flags with his orange belt in action and a wonderful Ki-Hap! Love it! Judging panel, left to right, included Mr. Kern, Mr. Rogers, Master Hauptman, Mr. Hoops, and Mr. Mingus. The Tamm family made a super special effort… and we LOVED their cookies they brought… great design, too! Willy, the unofficial Lakes Martial Arts mascot (you might have seen him after class), wanted in on the yumminess! And check out the cool Mr. Kern cookie (each instructor judge got their very own!). How fun! Enjoy our summer break in August and we will see everyone back for our next session starting Sept 8! Stay tuned on the blog for the sign-up details.